Here goes, my review of the biggest Lego set commercially released to date - the Ultimate Collectors Series Millennium Falcon. 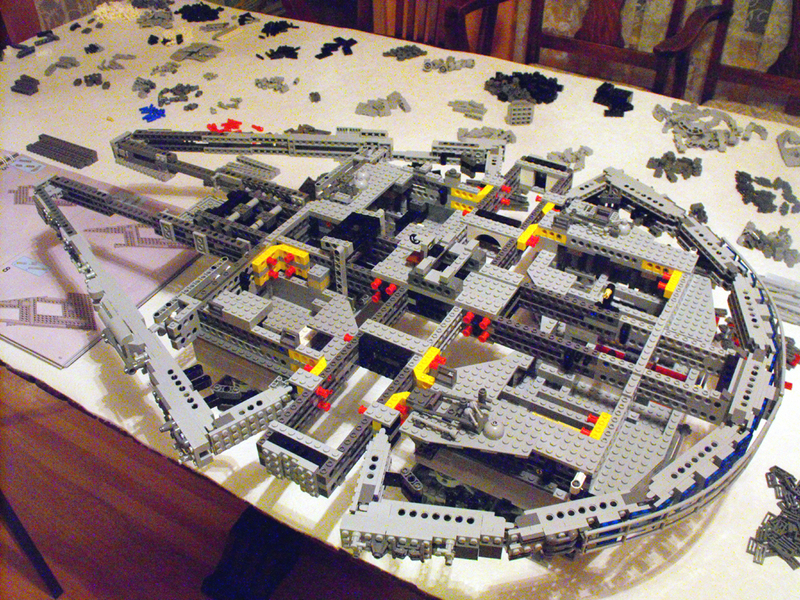 Based on possibly the most famous ship in the Star Wars galaxy, this set is positively huge. Please note, images to follow this weekend. 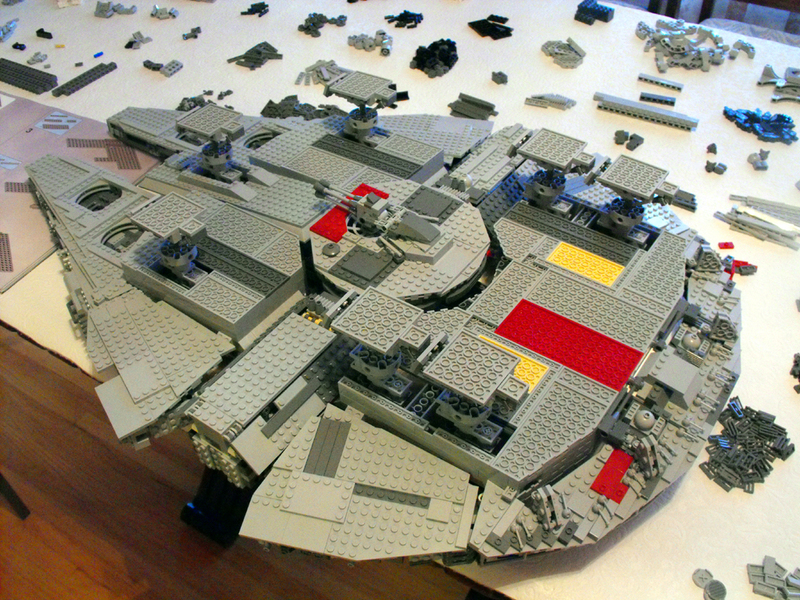 The UCS Falcon is a big set. 5195 pieces big in fact. This means that building it takes a long time, and requires organisation to make it as easy as possible. Opening the box and dumping the pieces into a single pile simply won't work with this. You need a lot of flat space - I occupied about 20 square feet to build. 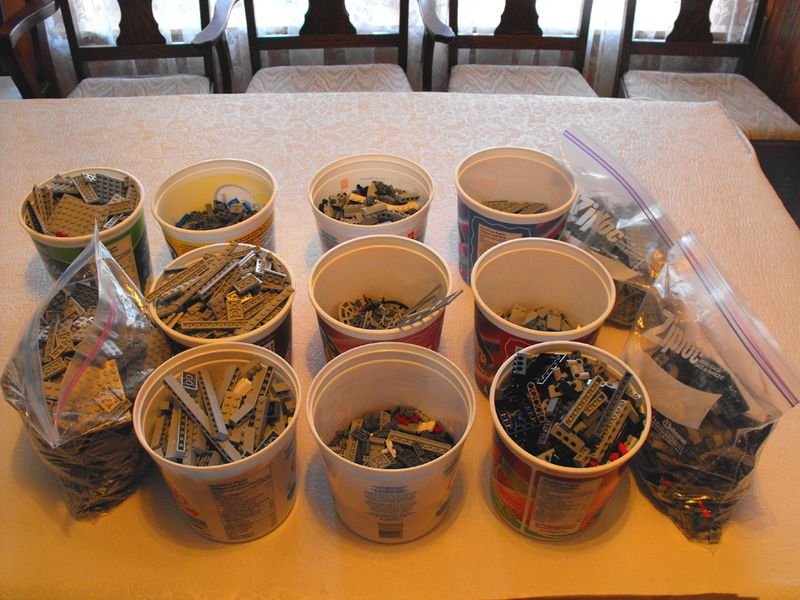 I spent two hours sorting pieces according to colour and type - for example, bley flats went together in one group, technic style in another, and so forth. My build took me 12 hours and 10 minutes, across two days. 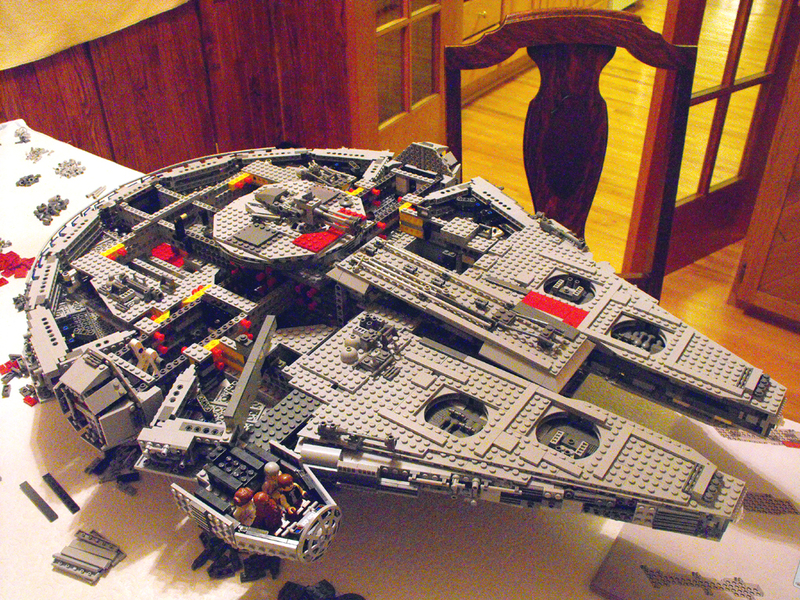 The Falcon follows the UCS ISD style of building, with an internal frame constructed first, followed by an outer shell. Unlike the ISD however, the Falcon doesn't feel flimsy when built - the frame holding it is truly massive. I really doubt we'll be seeing drooping problems in a year or so. The outer panels are held fairly securely for the most case, with the exception being a few of the top panels which are simply held by a single technic pin. The final object is a massive, heavy, ship. It can be picked up from a single point safely - the top gun turret. It's really not suited to swooshing - but as a UCS set, it's really for display more than anything else. I would note that care is needed when building to follow the instructions to the letter. I had one section mis-aligned by one stud, which wasn't picked up until about 100 pages later. It was a bit of a pain to fix! It can be repetitive. A good example of this was the landing gear - 7 of them, all identical. The forward mandibles also suffered this problem. I'm rather disappointed with these. You get Han, Leia, Luke, Chewie and Obi-Wan in Episode IV style. However, there's no guns, and crucially, where is R2-D2 and C-3PO? An extra two figs wouldn't have cost much, but missing out these two iconic characters is a real shame. Spot on. This is the best rendition of the Falcon by far. It's movie-accurate and simply fantastic. Pathetic. But then it's a UCS set. There's very little scope for modding the interior due to the massive frame inside, and there aren't even chairs in the cockpit. However yet again, it's a display model. If you want to play with a Falcon, get 4504. The UCS Falcon comes out at 6p a piece, or roughly 11 US cents. Obviously this is paying for the UK RRP of �349.99. It's expensive, but not bad considering the number of pieces. On that note, a single Falcon will provide plenty of MOC material if you can ever bear to take it apart. It's got a few flaws, but it's a set every true SW Lego fan needs to have. Sell your house, I don't care. Just buy this set. I'm glad to see this great set score low on "minifigs" and "playability". For a proper UCS set, that's as it should be. Based on the price and complexity of this set, its not like its marketed at the "kiddies" anyway. I agree completely - it's solely intended as a display set. I never quite understood why minifigs were included at all, but I rated it lowly on those because if Lego decided to include them, they should have done a proper job! I wouldn't like to see a child try and put this together. It's just too complex. I think the figures should be rated higher. Whilst Chewie is an old figure and Leia could be made from other (rare) parts, the other three figs are all new. They're included because the vehicle is minifig scale. What would be the purpose of a minifig scale set without minifigs? What would be the purpose of a minifig scale set without minifigs? 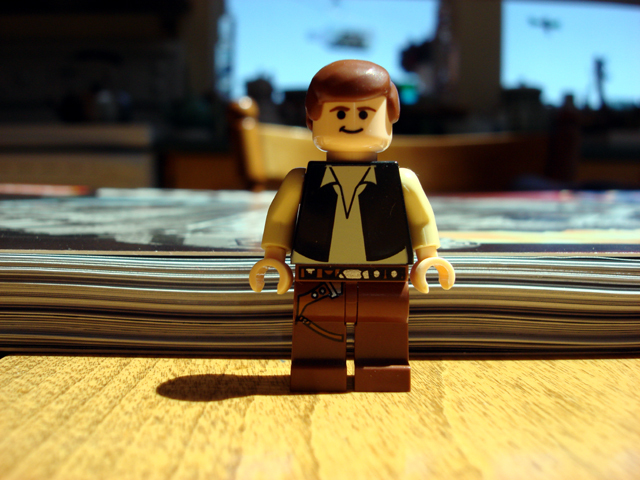 What was the purpose of making this UCS set minifig scale? If they included ZERO minifigs in the set, perhaps the set could've been sold cheaper. (how much I don't know... $40-50 less?). My biggest gripe with the set is the price (or I should say, the CANADIAN price which is $680!). Rubbish! Why do the minifigs bump the price up so much? I know they cost alot to produce but at the end of the day, it's just plastic. The minfigs can be sold for around 100 dollars, according to the stuff I've seen on BL etc. 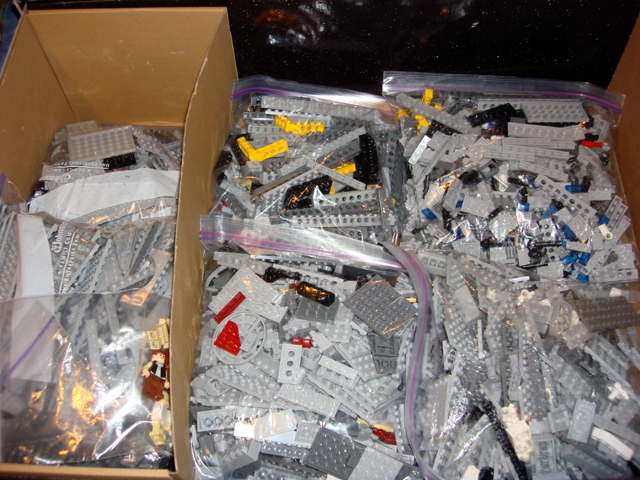 I concur with sam89, there's no purpose to have a minifig-scale set without minifigs. 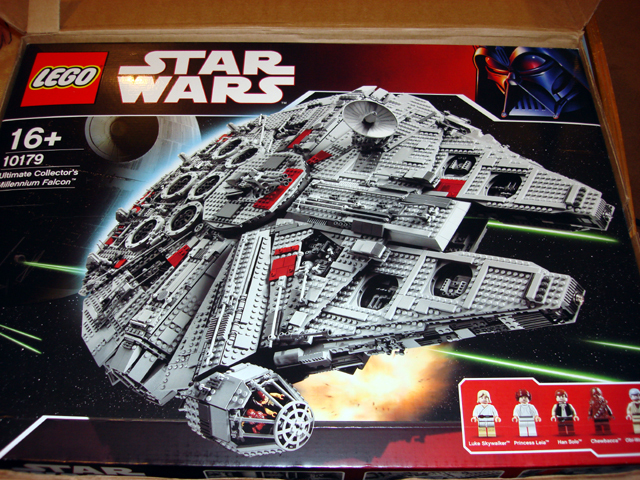 UCS is just a term referring to the "ultimate" degree of the the set. A set can be minifig-scale but not ultimate, but this set is ultimate enough and thus falls under the category of Ultimate Collector's Series. Do I win anything if this is the highest? This is my building of 10179 in stop motion. I am going to take my falcon to Taipei for exhibition of 30 year anniversary of star wars. Hope it won't fall apart. Leo1127....very impressive stop motion video. I really liked the movement of the pieces within each step! Well after a hugely long wait, and having had it in the house for the last couple of months I have finally been able to put mine together and I have to agree with the original review. No C3PO and R2D2 as discussed earlier and why-o-why in such an expensive set are the instrument panels stickers?? They should be printed! But, apart from those grumbles it is a great set... whatever will they produce next?? I'm in the process of buliding this set and I would agree for the most part with the low minifig rating. C3PO and R2D2 really should have been included. Although the others are pretty cool such as long haired Luke and Leia in the white dress. And YESSSSS the Canadian price is nuts!! I bought mine from an ebay seller. At $500 US and a generous ebay seller who fudged the value on the customs form I saved $240. nice. "What was the purpose of making this UCS set minifig scale?" Thats like saying why climb a mountain. I suspect some guy at lego just said hey what if we......... It's a challenge and a very cool kit results. This was a thoroughly enjoyable build, spanning about twelve hours over the course of three days. Given enough time and a good supply of snacks and caffeine, I could have built the set in a single day, unlike the UCS Star Destroyer and Death Star which I found to be very tedious and repetitive, necessitating frequent breaks. While there are a number of mirrored sections to build, most have differences in the details, requiring your attention and keeping things interesting. Almost 5200 in all, mostly light and dark bley with a smattering of black, white, dark red and tan thrown in. 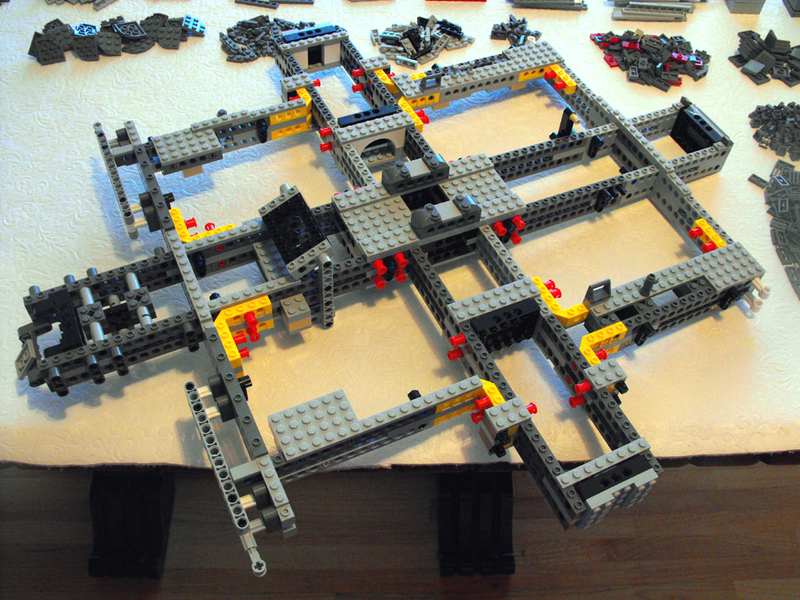 The technic parts are mostly from the colourblind monkey design studio (red pins, blue axle pins and yellow L-bricks), however, none are visible on the finished model so it doesn't much matter. 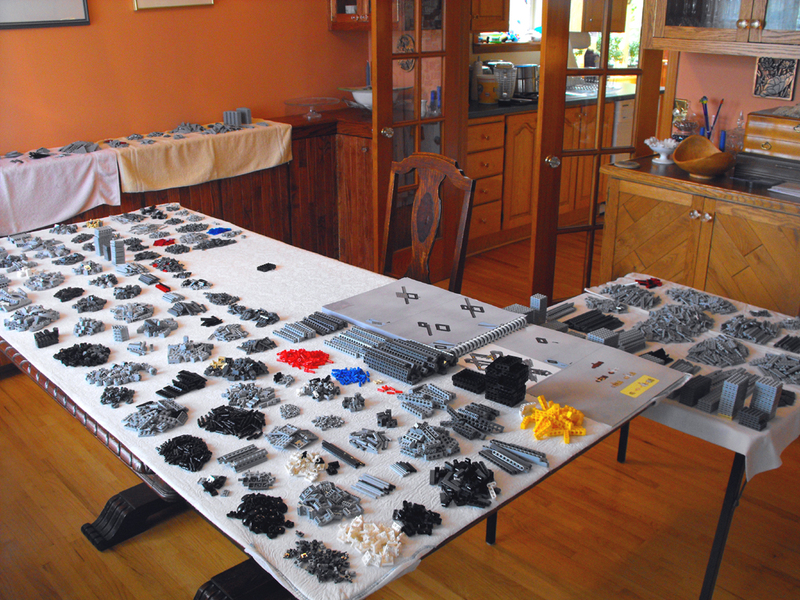 Most parts are included in large quantities, so you've got a great start for a MOC, should you decide to break the set down at some point. A nice inclusion as far as I'm concerned. At the time unreleased fleshie versions of four of the main characters plus another Chewie. Obi-Wan's head also makes for a great custom fleshie Count Dooku if you're looking for a spare. I'm a little disappointed that none of these figs will be exclusive once the new Death Star is released though. Quite frankly, I don't see much point in including any other figs, such as R2-D2 and C-3P0, seeing as how there's nowhere else in the model to display them. Very nice, well greebled and lacking the large plain spaces of the Star Destroyer, although much easier to accomplish given the larger scale. My biggest complaint is that the retractable blaster cannon isn't included despite being listed on the stat card and the fact that there's certainly room to put it in between the cockpit and the boarding ramp. About half of the underside is just plain studs down construction, which doesn't really jive if you want to hang the set for display. While limited for a minifig scale set, it's not bad for a UCS. The quad lasers swivel and the boarding ramp raises and lowers. The set is surprisingly swooshable, if you've got the arm strength that is. I was able to tilt it more than 45 degrees in all directions without anything dislodging. Good overall, but not quite up there with the other UCS sets, although I suppose the minifigs add significantly to the cost. As usual, the US retail price is significantly lower than anywhere else, so much so that most international buyers would probably save by purchasing one through the USA, even by legal means. Currently available through shop@home and LEGO retail stores with sporadic appearances at other retailers. Quite frankly, this shouldn't have any bearing on a review as far as I'm concerned, as most widely released sets from the past decade are still readily available through secondary channels. They might cost a lot more than you're willing to pay, but they're certainly still out there. This is near perfection in a LEGO set. While most of my complaints wouldn't even register on a typical minifig set, the inflated international prices and the fact that this was meant to be the cadillac of LEGO's current offerings but still has a few minor but obvious omissions are the only things precluding me from giving it a perfect score. Location: Somewhere in Minnesota. UFFDA! Why must I be forced to choose between the Death Star playset and this work of art in plastic?! What do you guys say? Some donations would be greatly appreciated. On the subject of the model, how unstable would it become if one were to, say, add an access tunnel between turrets? Nothing fancy, just something like a padded white tube with a ladder. For some reason, I always have a bad feeling about things. You should be able to build that access tube without too much trouble. There isn't much in that center ring. It looks like a great set. I've been tempted to get one but saving my money for the new Death Star. i just put this on Layby, could someone help me, what is the square dimension that the landing gear take up....i need to know if it will fit on a particular table of mine, with expected overhang of the actual ship. The landing gear consists of seven feet. Four toward the back as two sets of two behind each other, two more the same width apart roughly level with the cockpit and a single one even further forward. A rectangular area to hold all seven feet needs to be around 13 inches wide by 19 inches long (32 x 48 cm). The overhang is about 5 inches at the back and the side away from the cockpit, just over 6 inches on the cockpit side and almost 10 inches at the front (from the single landing gear to the tip of the mandibles). You are either single, or lucky to have the worlds most understanding wife. My building zone has been relegated to the basement. I still haven't opened the box for this set. Between the new baby and my job getting busier, I may not get to it until next year some time.